If you’ve ever taken time out of your day to think about goats (I mean, you do that on a regular basis, right?) you probably think of loveable fluffy creatures at petting zoos or the cute one you saw at the farm that one time when you were about five-years-old. However, the goats you see around you normally have owners or farmers and are bred for one reason. 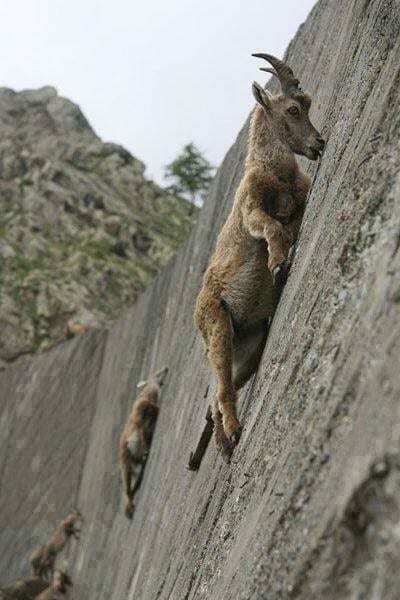 BUT there are some goats in the world that roam free, and they spend their time chilling out on the edges of cliff faces. As you do. Obviously, we’ve been calling mountain goats mountain goats throughout the whole article, but the whole name is a misnomer. In fact, mountain goats aren’t goats at all (which is why they bear no resemblance to the goats you used to cuddle as a kid. These animals won’t take kindly to a hug). Instead, these animals are actually a member of the antelope family – with many of them bearing the same similar antlers to other antelopes. Because they are antelopes, mountain goats are strictly herbivores (they’re on a no-meat diet to fit into their wedding dress) and graze primarily on grass to fill their bellies. Similarly to us, they like having a bit of salt in their diet (mmmm, fries) but unlike us (yes, really) they like to lick the handrails around popular tourist trails to taste the human sweat. Gross. As you can tell by their name, mountain goats live in the mountains – normally in Northern America and Alaska. If you ever find yourself at 10,000 feet, you’ll see a plethora of mountain goats as this is their desired altitude for survival. In the winter months, the mountain goats travel to the tops of the mountains with harsh winds, and below-freezing temperatures, but their luscious white coats keep them warm throughout these periods. Why do they love chilling out on cliffs so much? 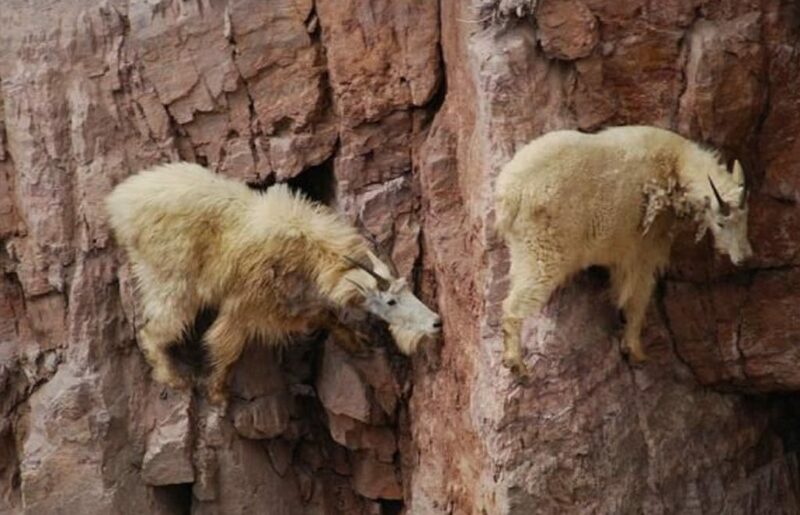 The main reason these mountain goats love hanging out on the edges of cliffs is basically because they love to be alone (same). As some of the only animals to be able to travel these terrains, they are left alone by predators, meaning they can go about their lives without being pestered by bears, wolves, and cougars.